Poem is in center-right of photo. Poem Elf is in black. I just returned from beautiful New Jersey (yes, beautiful: it’s much more a garden state than an armpit) visiting my sister Wizzie. All weekend I was charmed watching her children play outside. A slight chill kept me indoors, observing them through the glass, but spring sunshine made the front yard irresistible to them. My four-year old niece Emily has a presence somewhere between a fairy and an imp, both creatures most comfortable in open air. I could have watched her play for days on end. She’d ride her scooter back and forth on the driveway, singing, laughing, sometimes frowning. Then she’d hop off to examine the dirt or to sit talking to herself. At one point she knelt on the front stoop, hands folded, eyes closed, praying to the “Mother of God,” as she later admitted, for favors unknown. Watching her made me think about how little time I spend outdoors and how disengaged I can be when I am. Sometimes when I’m outside it’s as if I’m checking off a list: soak up Vitamin D, check; feel gratitude for cumulus clouds, check; raise heart rate hiking up hill, check; detox lungs with cold winter air, check; and so on. 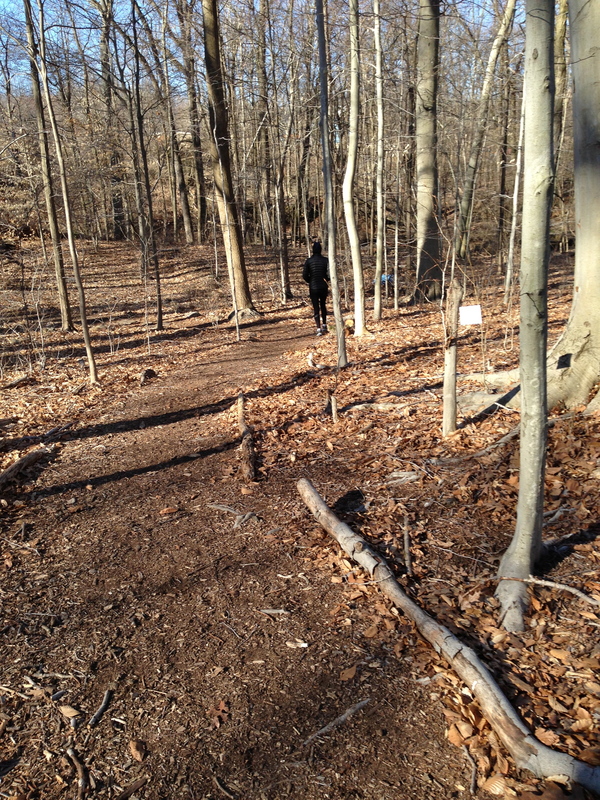 It’s a far more detached experience of nature than I had as a little girl, playing with bugs and shouting in the wind. That’s why I’m so drawn to “This Morning” and “Gift.” Both poems describe a communion with the natural world I miss. The first poem, even though the setting is indoors, captures that childlike delight in the aliveness of everything out of doors. One of my favorite chapters in the wonderful P.L. Travers’ Mary Poppins series covers a similar theme. 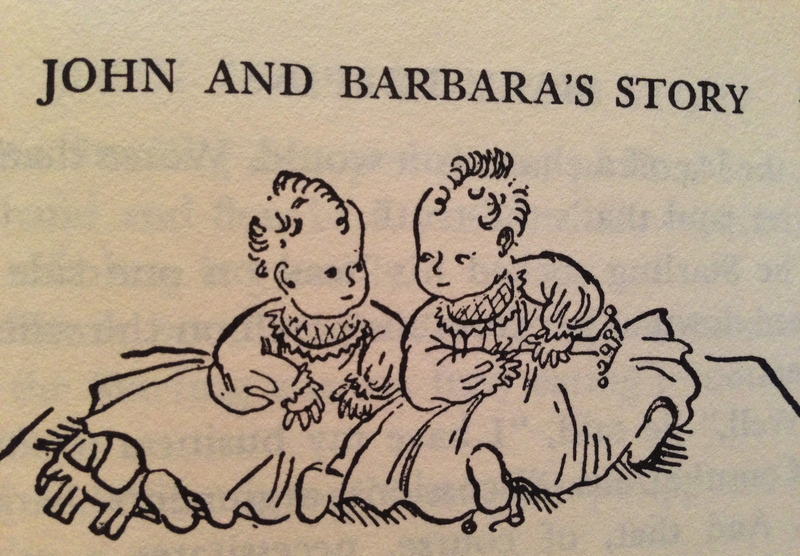 Seven-month old twins John and Barbara Banks, the younger siblings of Jane and Michael, lie in their cribs talking to a starling, the wind, the sun, and of course, to Mary Poppins. The conversation is not a back-and-forth of baby babble and bird warbling, but a fully grammatical and meaningful communication. “How soft, how sweet you are! I love you,” said Barbara, holding out her hands to its shining warmth. “Good girl,” said the sunlight approvingly, and moved up over her cheeks and into her hair with a light caressing movement. “Do you like the feel of me?” it said, as though it loved being praised. “Dee-licious!” said Barbara, with a happy sigh. The idea that some joyful knowledge was forgotten in growing up was an entrancing idea for a girl like me who didn’t want to give up fairy tales, who looked at adolescence as loss and adulthood as the end of fun. The poet’s relationship with nature in the second poem, “Gift,” is less one of giddy happiness than equanimity. The poet works in his garden by the sea with great contentment. Maybe it’s my age, but I’m beginning to value contentment over happiness. It’s is the more reliable sister, the one who stays after the party to help with the dishes when happiness has flown out the door for the next gig. Milosz’s contentment has a Buddhist flavor. He’s content because he’s detached from those things that cause suffering: in order, greed, envy, bitterness, and regret. With the lifting of the fog, his vision is clear. He’s focused on the present, not on the past or the future. 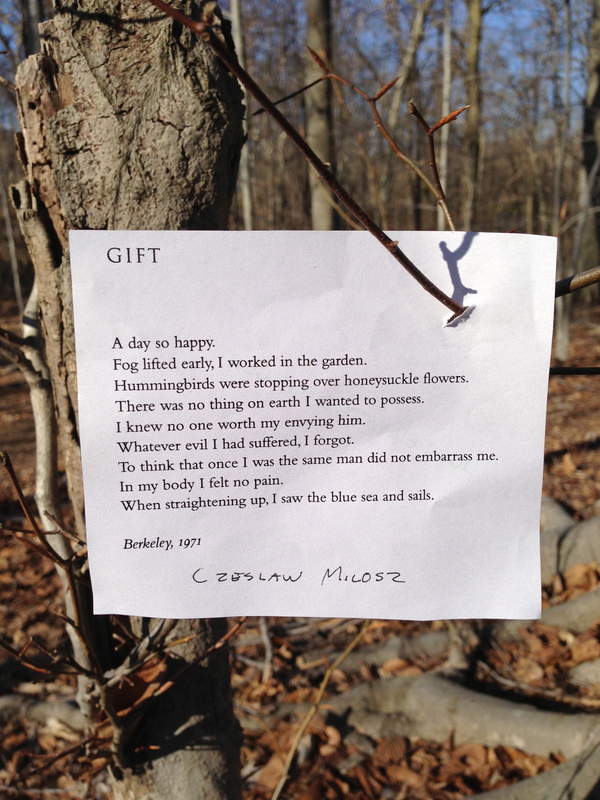 It’s a cliché these days to say every day’s a gift but it probably wasn’t in 1971 when Milosz wrote the poem, and somehow even today he makes that idea as fresh as the New Jersey spring I wish would come to Michigan. 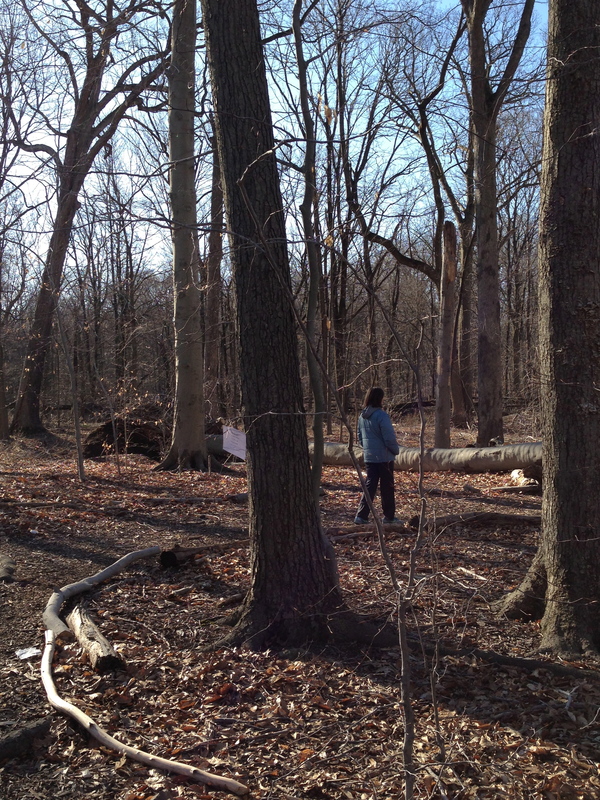 I left the poems on a nature trail a block from my sister’s house. After sticking the poems on tree branches, I sat down to tea and scones with three of my sisters and my mother while my brother-in-law prepared bacon and eggs in the kitchen. I knew how lucky I was. Like Milosz, I had no desire to be anywhere else or be anybody else. Our time together was brief and all the more valuable for that. A day so happy. 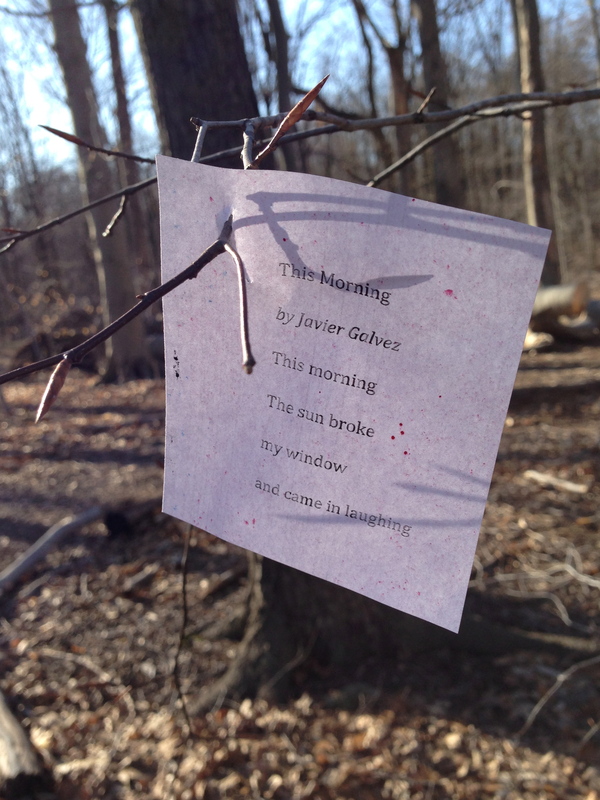 I found “This Morning” in an old college anthology of my sister’s, but I can’t find out much about poet Javier Galvez. I can only tell you he was born in 1947 and is probably a Mexican poet and wrote a book called Encanto Chicano. Anyone know anything more? 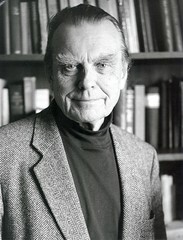 Milosz is considered one of the great minds and poets of the 20th century. Fluent in five languages, he translated the Old Testament, Shakespeare and Whitman into Polish, taught Slavic languages at Berkley, and won the Nobel Prize for Literature in 1980. His face has been put on a Polish postage stamp. He’s honored in a Holocaust memorial in Jerusalem and has a poem inscribed on a memorial to shipyard workers killed by Communists in Gdansk. Because the poem has Buddhist overtones to me, I was interested (as I always am) in the poet’s spiritual side. He was Catholic, but did not want to be considered a Catholic poet. For those interested in his Catholicism, you can read his discussion of belief here. The essay is from 1982, long before the abuse scandals, so when he writes of the “remarkable successes of American Catholicism,” he’s not being sarcastic.